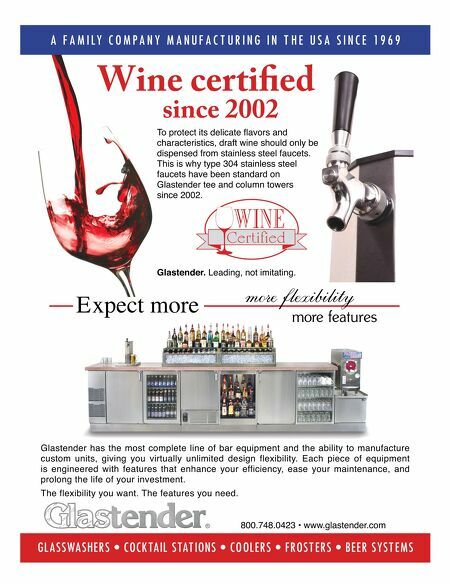 JANUARY 2014 • FOODSERVICE EQUIPMENT & SUPPLIES • 79 Increase your cash fl ow by decreasing your trash fl ow - Glastender's BDS reduces the volume of glass bottle waste by as much as 85% www.glastender.com include Cantina Laredo, Cool River Café, Silver Fox Steakhouse, El Chico, Good Eats and Lucky's Cafe. With tabs averaging $87 a person and square footage top- ping out at 24,000, III Forks is considered CRO's crown jewel. Along with becoming more adept at catering to younger customers who seek smaller portions and sharable appetizers, adjusting to rising beef prices repre- sents a signifcant challenge for III Forks, like most steakhouses. "We've done everything we can to negotiate and hold down the astronomical price of prime beef, which is what we are known for," Watson says. "III Forks' vice president of purchasing Joette Cox and her team have done a terrifc job accomplishing this." III Forks also updated its décor to a lighter palate with clean lines and a contem- porary look from a typical, more masculine steakhouse design. The Chicago location opened two years ago, for example, and has a midcentury modern design aesthetic in its materials and fnishes. Depending on the location, seating ranges from 280 up to about 900 customers. 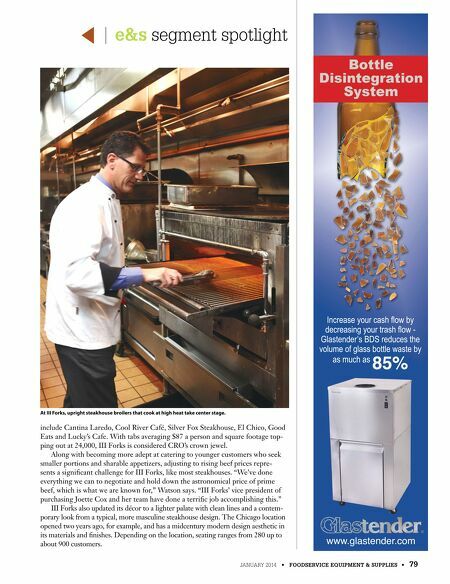 e&s segment spotlight At III Forks, upright steakhouse broilers that cook at high heat take center stage.